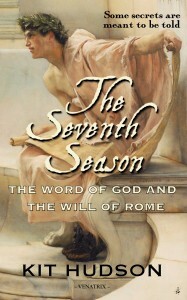 The new edition of The Seventh Season has now been re-published. If the back cover text below whets your appetite, then please download the FREE SAMPLE. In 67AD, Johanan – the adventurous young scribe of the Apostle Andrew – flees the siege of Caesarea on a ship sailing for Greece. He is bound by oath to protect the Word of his master… no matter what pirates, fate or the gods of Olympus have in store for him. Onboard, he meets two people who will change his life… and the course of history. The first is a Roman General appointed to organise the Olympic Games at which the Emperor Nero will compete. The second is Dido, an enigmatic young woman from Alexandria who is carrying a cargo of secrets. To uncover the truth about her past, Johanan must first prove himself worthy of her trust. The Seventh Season is an epic adventure in the classical tradition that takes readers on a thrilling journey through the ancient world. 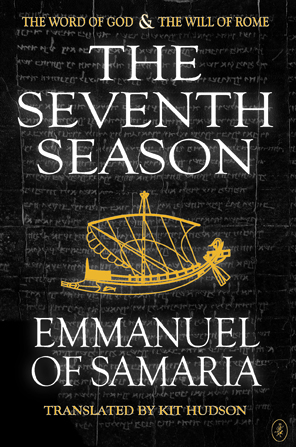 Translated by Kit Hudson from controversial texts by Emmanuel of Samaria, it gives an explosive eyewitness account of the struggle between a dangerous new religion, and an Empire at the height of its powers.